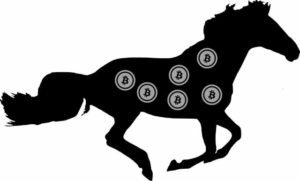 Compare 2019's Best Bitcoin Horse Racing Betting Sites: Claim Your Bonus & Play! Horse race betting is one of the oldest forms of gambling has been around for thousands of years and can now bet on horses with Bitcoin. Today, betting on the horse is just as popular as it ever was. To be effective at betting on a horse it is a must to understand the different types of bets that you can make. You will find that most online Sportsbooks with Bitcoin will offer a number of different kinds of wagers for bettors. There are five basic types of bets for horse racing called the Straight bets. They include Win, Place, Show, Win & Place and the Across the Board bets. There are also a number of exotic bets that include Exacta, Quinella, Trifecta and Superfecta bets. We will go over each of them, so you will have a strong grasp of how to bet on horses by the time you’re done reading this article. Win Bet: This is the simplest of the bets. With a “win bet,” you wager that your horse will come in first place. If they do finish first you win, if not you lose. Win bets offer good payouts, this is especially true if the horse has long odds. Place Bet: With this wager, you are betting that the horse will finish in the second position. To win your horse must finish first or second place. The payout for this bet is not as good as a win bet, but can still be worthwhile. Show Bet: Here you are betting that your horse will finish in the third position. To win they must finish first, second or third. This is a low-risk bet and offers the lowest payout of any of the straight bets. Win Place Bet: With this bet, your horse must finish in first or second. If they do come in the first position you collect on both wagers. If they finish in the second you only collect one payout. This bet allows you to collect part of your bet back even if your horse does not win the race. Across the Board Bet: You are betting that your horse will win, place and show. The horse can finish in any of the first three positions to earn a payout. If they win you get three payouts, if in second two and in third only one. Exacta Bet: With an Exacta, you are wagering on two horses. You bet on which horse will come in the first position and which horse will come in the second position. To win the bet the horses most finish in the order you bet on, otherwise, you lose. Quinella Bet: A Quinella bet allows you to bet on two horses as well, but they can finish in any order of first or second position. In this bet, the order in which the horses finish does not. If either of the horse doesn’t finish in the correct positions you lose your wager. Trifecta Bet: A Trifecta bet requires you to pick the first, second and third position horses in order. If any of the horses don’t finish in the correct position you would lose the bet. Superfecta Bet: This is a four-horse bet were you pick the first, second, third and fourth place horses in the correct order. All major Sportsbooks also have Horseracing Books, few offer Bitcoin betting though. Before you place a wager on any horse race make sure your choice a site that is trusted and reliable. Betting at the wrong site could cost you your hard earned money. We personally trust Bitcoin Sportsbooks listed on BtcSlice.com, since we tested each of them.